Got a Cat? Poison Proof Your Home! What are the most common toxins for cats? 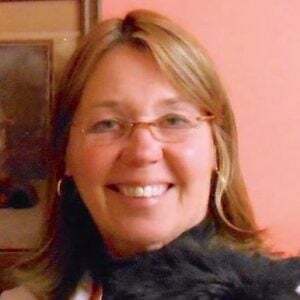 Veterinarian Debora Lichtenberg arms you with the knowledge to poison proof your cat home. All this talk about toxins and poisonings. And so much about dogs. What are the most common toxicities to cats? A reader just posed this important question. Dogs are typically more of a worry when it comes to toxicities because they have bigger potty mouths than their feline friends. Some dogs will eat anything. Even though cats are more discerning in their dietary indiscretions, they can get into trouble too. Owners are also to blame for giving toxic medications to cats or placing harmful topicals on them. That’s Not a Cat Toy! First, letʼs talk about harmful things cats ingest on their own. Assume that anything dangerous to your dog is also dangerous to your cat. Chocolate, raisins, macadamia nuts and xylitol (a sugar substitute often found in certain gums) head up the list. Antifreeze is very dangerous. Of course, rodent poison is BAD. Obviously, it takes a much smaller amount of an offending substance to poison a cat. Even if cats donʼt necessarily have the appetite that dogs do, kitties love to play with things. 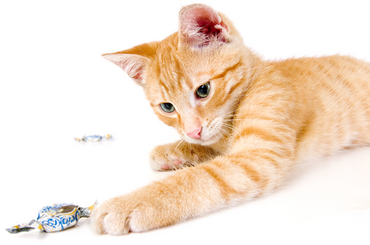 Think about sticks of sugarless gum, pretty harmless if your cat knocks around a piece for a minute. But in no time, they have it between their cute little paws, theyʼre biting it, theyʼre lying on their back and theyʼre swallowing it. Same with little fun boxes of rat poison pebbles or bottles full of pills. Assume that all NSAIDs are toxic to your cat, and don’t give them. Don’t give “cat doses” of your dog’s medications to your cat either. And then there’s Mr. Take-One-Aspirin-And-Call-Me. Blackie hadn’t been feeling well so Mr. Take-One was giving the cat an aspirin a day. For three days! Blackie was feeling worse. This always amazes me. Of course the owner should have called me before giving any medication, but wouldnʼt common sense, even with the best DIY instincts, dictate that a cat dose is much smaller than a human dose? Even half of the regular two-aspirin dose is too much for a cat that weighs 2% of your body weight. Flea and tick medications are generally safe for your cat, unless your cat has a specific allergic reaction to a product. But many products labeled for dogs are NOT safe for cats. This is usually an honest mistake to make, but please check or read the packaging carefully. If thereʼs only a big picture of a DOG on the box, DONʼT PUT IT ON YOUR CAT. Antifreeze is all too appealing to cats that have access to it. The toxic form of antifreeze has a very sweet taste, and cats are intrigued by little puddles of liquid on a concrete floor. They may hate baths, but they love to put that little paw in a small amount of water and lick it. A very small amount of antifreeze can kill your cat. Pet-safe antifreeze is readily available now. If you are your own Mr. Goodwrench and use antifreeze, buy the safer stuff, not only for your own pets but for your neighborʼs. My saddest case of antifreeze poisoning occurred because pets had access to a neighborʼs open garage with spilled antifreeze on the floor. Ethylene glycol, the poison in antifreeze, is also in many other products, including brake fluid, condensers and heat exchangers to name a few. Illegal drugs (it was always the roommate’s). Real lilies, including Easter lilies. ADHD and antidepressant drugs, particularly a tasty drug called Effexor. Spilled liquid potpourri. The cats step in it and try to groom it off their paws. Glo-jewelry and toys. Cats are attracted to them. These are not that toxic, but the cats salivate, foam, occasionally wretch and vomit. Adds a bit of a fright to your Halloween. Give the cat some milk or fishy cat food to get the nasty taste out of their mouths, and they’ll be fine. The scope of this article is too small to explain why these substances are toxic and what the treatments are. All too often, you may not know your cat got into these things, so the lesson here is prevention. Don’t leave these toxic foods, medications, plants and topicals lying around. Keep your pocketbook away from your cat if you have toxic ingredients in it (I’m not talking about yesterday’s lunch). If you have any worries, call your veterinarian. I don’t think I’ve ever minded a phone calls about a possible toxicity, because most of the questions are valid. 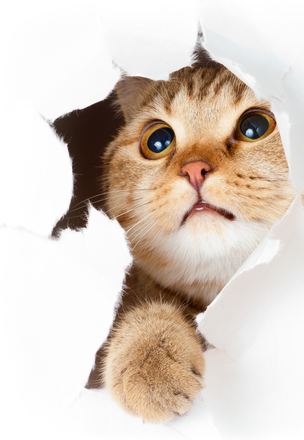 If you KNOW your cat got into a toxin, early treatment is the key to possible success. Although true antidotes don’t exist for most of the poisonings, supportive veterinary care gives your cat the best shot of survival and complete recovery. Have a safe and happy new year. Take your headache medicine if you overdid it, and keep it away from your cat!